I know what you may be thinking. A holiday post already? It’s only the middle of October! But, hear me out. Creating a genuine holiday experience for your employees is not an easy task. You’ve probably experienced a similar situation: it’s the week of Christmas and you have nothing planned. Instead of creating a memorable and engaging experience for your employees, you decide to throw together a half-baked potluck. This year, it’s time to change the status quo. The weeks between Thanksgiving and the New Year are particularly difficult in the office. The deluge of vacation time approaching can make employees less than productive, not to mention the sick time involved with quickly-spreading illnesses around open-air environments. Plus, it’s the holidays! From Thanksgiving to Hanukkah, Christmas, Kwanza, and New Years’, there’s a chance that almost all of your employees are looking forward to a much-needed break and quality time with their loved ones. According to a University of Pennsylvania study, expressing thanks may be one of the simplest ways to feel better. Sure, it may sound cheesy, but simply thanking your employees for a job well done can help them stay engaged and more productive through the holiday season. Forbes suggests hand-writing holiday cards with positive affirmations and thanks to each of your employees to remind them that they’re appreciated. A genuine “thank you” can be the gentle push your employees need to stay on task and productive through the end of the year. It may seem counterintuitive, but encouraging PTO during the busy holiday season can actually benefit your employees and their work. Lowering employee stress through flexible scheduling isn’t just great for their mental well-being during this busy season, it helps them be more productive. Almost everyone has a laptop and can work remotely, and allowing flexible schedules with work-from-home options are great ways to avoid bringing in additional staff or getting behind on priorities. Healthline research found that more than 60% of people were somewhat stressed or very stressed during the holiday season. With more employees out of the office and stressed about upcoming holidays, it’s important to communicate with your team so everyone is on the same page. Consider regular meetings during the holidays to make sure everyone knows who is in charge of what responsibilities, upcoming goals and priorities, as well as taking note of who has upcoming time off. 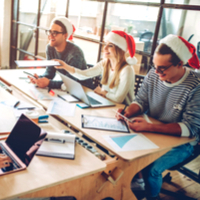 Ignoring, or simply forgetting, the holidays is a less-than-desirable way to keep employees engaged and focused on their work. Creating meaningful strategies by expressing gratitude, offering flexible scheduling, and communicating effectively during the holidays ensures your employees feel appreciated, as well as boosts morale and productivity in the office. Don’t wait until the last minute this year, and instead, start planning for the upcoming holiday season now! Finish the year strong by full recognizing, embracing, and celebrating the holiday season.